After a short break during our busy season in Bali, we have launched our latest Podcast. For our 11th Podcast we are very happy to present over an hour of fascinating discussion with Dr Mark Erdmann. Mark is the Vice President of Asia Pacific Marine Programs with Conservation International. 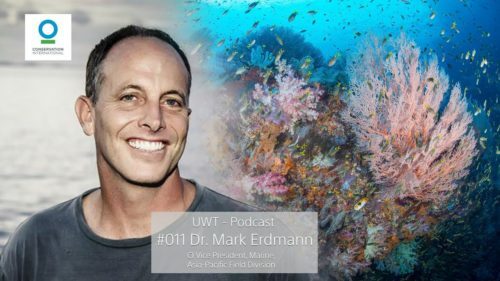 During our far reaching conversation, we discuss a wide array of topics including Mark’s history, the history of Raja Ampat as a Marine Protected area, and Mark’s hope for the future. We are very happy with this podcast and the positive message that Mark gives out for the future. Observant viewers may also notice a few changes in the studio, including a few more photos and a new paint job! We are hoping to continue with this series of Podcasts for many years in the future. We are always looking for interesting people who pass through Bali, please let us know if you have anyone in mind to feature. To be able to continue with the Podcast it makes it a lot easier with support and feedback from viewers. A great way to do this is to leave a comment on our YouTube channel. We offer the show in two platforms, both a video based YouTube version as well as an audio version on the iTunes store and Soundcloud. If you aren’t already subscribed to us on these various platforms, please feel free to do so, you will be automatically notified about new content. Have you missed our other Podcasts? Have a look at our Podcast Page for links and descriptions of all our past episodes. Our previous guests include underwater photographers, conservationists, film makers, free divers, and explorers. The episodes range anywhere in length from 45 minutes to over one hour of informative and entertaining dialogue.